Here are several techniques to make ThumbsPlus perform better in various environments. These hints apply to ThumbsPlus version 9 and 10. Most of them apply to earlier versions as well. You can access the hints by symptom or by category. Or just read them all; each will provide some insight into how ThumbsPlus works. Assuming you have a relatively new CPU (ca. 2009 or newer) and the appropriate amount of RAM for your workload (generally at least 2GB), an SSD is likely the best way to obtain immediate performance improvement for your system in general and ThumbPlus in particular. I recommend modern SSDs (from 2012 or later), as many of the earlier SSDs had poor write performance, limited lifetime, and rapid performance degradation with a heavy disk write volume. Make sure the SSD you purchase has wear-leveling and implements TRIM. I've bought most of mine from newegg.com. Read the reviews to find the best value. Make the SSD your Windows boot disk for immediate performance improvements in booting, starting programs, disk accesses, database accesses, and just about everything you do. Install ThumbsPlus on the SSD to improve program startup speed. Create or copy your ThumbsPlus database to the SSD. Especially for a large database, this will improve the performance for thumbnail creation (Thumbnail · Make... and Thumbnail · Scan...), loading folders and thumbnails from the database, finding thumbnails (Edit · Find), and processing batches of thumbnails; for example, assigning keywords (Thumbnail · Keywords), setting user fields (Thumbnail · Assign user fields) and modifying file info (Thumbnail · Modify file info). Even if you are accessing the thumbnail database over a network connection (whether the built-in .tpdb8 or client/server), you'll see improvement from an SSD as long as your network is relatively fast and not over-saturated. For client/server databases with full recovery logging, you'll get the most improvement by placing the database itself on SSD. The log file should be on a separate disk, but it can be on a fast HD since it is written sequentially. It's best to preallocate the full log file size to avoid repeated log file extending and fragmenting. For client/server database with simple logging, both the log and database can be on the same SSD because simple logging does not use the log the same way as full recovery logging.. See the Client/Server Databases page for additional information about logging and recovery models. Large images and movies can remain on HD. Sequential access to large files is not improved as much by using an SSD, because disk seeking is much lest frequent. Be sure to defragment your hard disks regularly! ThumbsPlus itself does not require a lot of memory, but working with large images does! If you're working with very large images and are running other memory-intensive applications, it may take much longer than expected to view, thumbnail or convert images. Memory is cheap these days; one of the fastest ways to speed up your computer is to add memory! Running a lot of background tasks can require a lot of memory, especially if large files are being loading. Try reducing the Maximum concurrent tasks in Options · Preferences · Advanced. See Multithreading for more information on tasks. For editing images, you can turn off Undo, or decrease the maximum memory ThumbsPlus will allocate for Undo operations. Both options are on the Options · Viewing · Editing. Other programs running using the CPU ("spinning") can interfere with ThumbsPlus and other programs. Because any background tasks, like making thumbnails, run at low priority, it may take them significantly longer to run. You can enable the option Run background threads at normal priority in Options · Preferences · Advanced. You may also want to use the Windows Task Manager or the wonderful Process Explorer from Microsoft to check for other programs using all of your CPU time. It can make expanding folders slow because of searching for sub-folders (in order to display the [+] for folders with child folders). To speed up the tree, disable Tree · Show Expandable. It may take a long to to update the file list when files are change , added or removed from the folder. To fix this, disable Watch changes in folder in Options · Preferences · Thumbnail View. With this disabled, you will need to use Window · Refresh Thumbnails to see any changes that have occurred in the folder. When viewing large numbers of files, the thumbnail view operates quickest if no user-defined fields are displayed, and no database information is required for sorting. When viewing a single image, ThumbsPlus builds a list of files for the Previous File and Next File functions. This can require a significant amount of memory for tens of thousands of files. Occasionally, old TWAIN drivers can cause ThumbsPlus to be very slow starting up or hang it altogether. Be sure to uninstall drivers for any scanners or cameras no longer on your system, and be sure your drivers are up-to-date for your currently connected hardware. If the manufacturer did not provide an easy way (such as Add/Remove Programs in Control Panel), you can disable drivers individually using Device Manager from Control Panel · Administrative Tools · Computer Management. If you don't use ThumbsPlus for scanning images, you can completely disable TWAIN in Options · Preferences · Startup. If you're unable to run ThumbsPlus at all (it hangs completely), you can disable TWAIN by adding -notwain to the command line for the shortcut. See the screen shot to the right. Note that -notwain comes last, outside of the quotes. 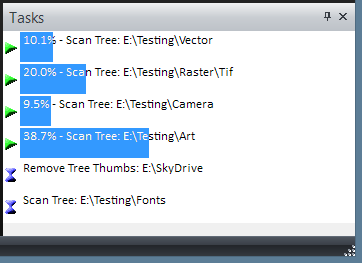 If you are not using ThumbsPlus to view files within ZIP files, turning off this option will speed up many folder tree operations. Also, invalid zip files can cause performance problems. If you receive ZIP error message during folder or file operations, you may want to rebuild the mentioned zip files. Because of the amount of processing required to completely decode raw camera files, they are generally slower than other formats. If you need to rapidly look at a bunch of images, you can use Options · File Plug-ins · Digicam Plug-in to load the embedded JPEG for viewing. You'll have to change this back for editing (though batch processing always uses the full raw image). Also be sure to set your camera for the largest allowed preview. If you spend a lot of time culling or sorting raw images, you can use the slide show as well. By default, the slide show uses the preview. Loading some Canon raw (CRW, CR2) files is somewhat faster if Suppress noise filter is checked on the Canon tab. Nikon (NEF) files will generally load faster if you uncheck Use Nikon libraries to load images on the Nikon tab. The default database format (MS Access JET) is not designed for concurrent use by a large number of users, so you may see performance degradation as additional people connect. There is not a specific number of users — it really depends on how active the users are and how many are accessing the database simultaneously. In situations where Access JET is just too slow, we recommend a client/server database, such as PostgreSQL, MySQL, or SQL Server. Our database page lists the databases that we test and support. Also see the Network performance hint below. ThumbsPlus is database driven; all thumbnails, annotations, keywords, file information, galleries and queries are stored in the database. If the database becomes corrupted because of disk problems or frequent crashes, or becomes fragmented because of disk fragmentation, things can become unbearably slow. Databases upgraded from older versions of ThumbsPlus may also have thumbnails stored in non-JPEG formats, which take more disk space and longer to load (with old slow processors, this was better because the JPEG decompression was not fast enough for a screen full of thumbnails). Exit ThumbsPlus. If sharing a database, make sure all users have close ThumbsPlus. Make a backup copy of the database. Repair the database. File · Database · Repair. This will fix internal errors in the database. Be sure your thumbnails are JPEG compressed: File · Database · JPEG Compress. The recommended quality is 80; higher quality will require more disk space. Note that this will not recompress existing JPEG thumbnails. Compact the database using File · Database · Compact. This is kind of like an internal defragmentation of the database, and additionally frees any unused space. Defragment the disk containing the database. You should defragment hard disks (HDs) regularly and automatically for best system performance. I use Raxco's PerfectDisk, and recommend it highly. For the most part, you do not need to defragment SSDs, although you may see a small improvement for extremely fragmented files. Be sure the database is not stored as a compressed file! The thumbnails themselves, which make up the bulk of the database, don't compress well anyway, and Windows compression just adds extra overhead to every disk operation. Very rarely, usually after corruption and repair, Microsoft JET will completely remove an index from the database. (Indexes are used to quickly locate information). This can cause excruciating slowness, especially with large databases. We don't currently have a quick fix to this, but we plan to build in a check during database repair in the future. In this case, you'll need to restore your database from backup. ThumbsPlus has been multi-processor compatible and multi-threaded for over 20 years! Any background tasks (making thumbnails, batch processing, catalogs, contact sheets, web wizard) run in separate threads that can use multiple processors. You can see each task on the Tasks tab. Tasks waiting for an open slot show an hourglass; running tasks a green arrow. You can set the maximum number of concurrent tasks in Options · Preferences · Advanced. When dealing with large images, it's probably not a good idea to run a lot of background threads, because of memory limitations on a 32-bit platform. (We're working on a 64-bit version that will be able to use much more than the current 4GB limit for 32-bit processes). Multiple threads are also used for movie playback, database activities and the preview window. interface. Since version 7 SP1, image filtering in a view window uses all processors and cores. Other image processing functions will be multi-threaded in future releases. Large thumbnails and annotations require more network bandwidth than smaller ones. Storing all metadata (XMP) in the database can also require more bandwidth. You control this option at Options · Preferences · Thumbnails - Store complete XMP data in database. These will affect performance more noticeably over a relatively slow connection (< ~100mpbs). This holds for the built-in Access JET format database (.tpdb8) and all other types of database (see client/server databases). The default database format is designed for sharing by only a few users. See the shared database hint for more information. Do not put your temporary folder (environment variable TEMP) on a network or external drive. You set its location in Control Panel · System · Advanced system settings · Advanced · Environment Variables. Set the user variable for TEMP to a local hard drive or SSD. Here is a screen shot from Windows 8. 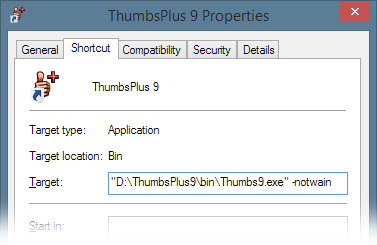 Don't install ThumbsPlus on a network or external drive. If you share ThumbsPlus between multiple users, it is best to install it locally on each user's system, on either a hard drive or SSD. Don't put the ThumbsPlus database on a network drive unless you're sharing it. Don't run too many thumbnail tasks that access or write to the same local or external hard disk because they compete with each other and cause unnecessary disk seeking (head movement). Website copyright ©2018 ThumbsPlus.com. All rights reserved. Please contact webmaster@thumbsplus.com with any website issues. This site uses Adobe Typekit for fonts.